The audience was on their feet before the stage was lit. Jeff Mangum (vocals-guitar) walked out to the mic, slung on his old acoustic guitar, and strummed the first chords of “King of Carrot Flowers.” The audience roared as the lights went up, let the hoedown stomp begin. 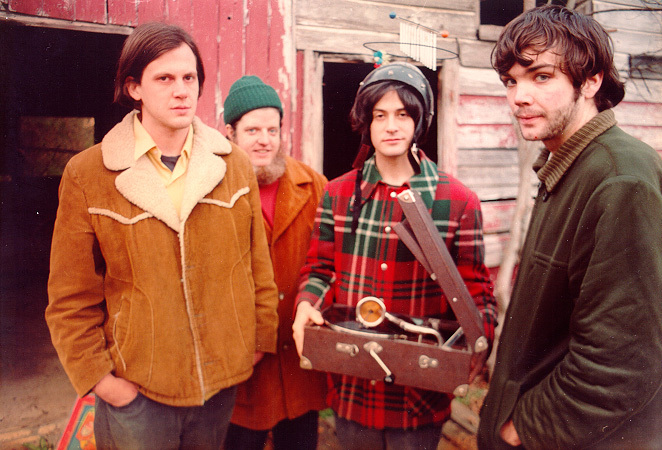 It’s been fifteen years since Neutral Milk Hotel has toured. Where once they would play small clubs whose’s stages could barely fit all the players, now they’re selling out theaters that hold nearly three thousand people. This was true in Boston at the Orpheum Theatre for two shows in January. They’ve been sorely missed. Mangum, bearded, shielding his eyes with a plain grey Castro military cap, wearing jeans,work boots and plaid shirt is the epitome of the working man. Casually, he acknowledged each band member as the audience screamed. Julian Koster added accordion to the song, and the crowd went nuts. Scott Spillane was forced to wave as he took position on stage with his horn. The crowd was ecstatically pleased to see the big man with the bristly white beard and mop-top hair. The concert followed the song list of Neutral Milk Hotel’s last album, the highly acclaimed 1998 In An Aeroplane Over The Sea. Mangum’s was in great voice and his hollar was clear and striking. The band adds character and an uplifting energy when it’s the whole crew of up to seven on stage. Koster, the youngest, I’d wager, looked cute as a button in a knit Angry Birds cap, as he jumped, danced and thumped his red bass with paper snowflakes taped to it on “Holland, 1945.” Jeremy Barnes added electronic bag pipes during the set, cementing the haunting melodies into the roots of Scottish Appalachia. But hints of punk, New Orleans Zydeco and brass dirges meld into an eclectic and layered sound. Driving drums, Moog that pulsed through your being, a bow with no rosin tearing up the banjo and the ever present accordion, sometimes two, builds an absolutely relentless sound, energetic and engaging. The audience would deliver rebel yells and Indian war cries between songs as Mangum sucked down water bottle after water bottle. Before “Comely,” the man in front of me yelled “we love you,” and Mangum, nodded and tapped his chest. It was a love fest. The title track had Mangum letting the audience sing with with him as he plaintively sang the lyric “soft and sweet, let me hold it close and keep it here,” with Koster’s etherial saw and Spillane’s horn added wonderfully to the cacophonous tune. Laura Carter from Elf Power, Neutral Milk Hotel’s opener, also played guitar, brass and sax on various songs sporting giant Elvis glasses and a red kerchief looking right at home between Spillane and Koster. Unkept and profound as the New York Times has said, indeed.